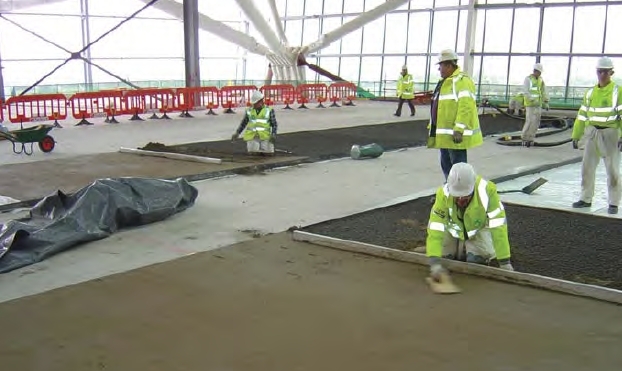 Screeds are covered by BS 8204, Screeds, bases and in-situ floorings, (2004). • To provide a wearing surface. • Floating (used to enable installation of thermal or impact sound insulation). The optimum thickness of a sand and cement bonded screed is 25–40mm, an unbonded screed should have a minimum thickness of 50mm, whilst a floating screed should have a thickness greater than 65mm for lightly loaded floors and 75mm for more heavily loaded floors. A minimum thickness of 65mm is possible provided the thermal insulation boards are firm enough for the compaction of the screed. There are proprietary screeds available that can be laid at thinner depths than conventional sand and cement screeds. Further reading: PYE, PW and HARRISON, HW. Floors and Flooring, BRE, 2003.